On Thursday, June 16th, over 35 people participated in a public meeting that defined how “green infrastructure” can control storm water runoff into Knitting Mill Creek and identified locations in the watershed where it might be employed. Over half of the people present lived within the watershed. The ideas that were addressed and critiqued included everything from buffer plantings and pervious walkways along the bulkhead to the conversion of 35th Street and North Colley Avenue into “green streets”. Many thoughtful and challenging questions were presented. Citizen questions, concerns, and ideas will be used by the engineering firm Tetra Tech in developing a final set of recommendations for the watershed. Those recommendations will be available in December, 2014. A complete record of the evening’s comments can be obtained from John Stewart (info@lrwpartners.org). The Friends of Norfolk’s Environment and the Lafayette Wetlands Partnership were presented with a check June 24 for $2,500 from Cox Enterprises and the Trust for Public Land. While we did not prevail as the winner of the “Cox Conserves Hero Award” for all of Virginia, we can be proud that we were nominated to represent Hampton Roads. I’m grateful for everyone’s support during the voting process. I know that many of you shared the nomination and voting instructions with your respective networks of friends and colleagues. I received many messages of encouragement – I appreciated them all. As I said during the award presentation today, there really are no losers in this program. Thanks to the Cox Conserves Heroes initiative, each of the three organizations in the running received a huge public push and a needed infusion of money. The Friends of Norfolk's Environment, the Lafayette Wetlands Partnership, and the City of Norfolk are working with Tetra Tech, an engineering firm, to identify how "green infrastructure" can filter storm water runoff that flows into Knitting Mill Creek. The outcome will be improved water quality through reductions in biological and nutrient runoff in our local waters. A public meeting will be held on Thursday, June 26th, from 6 p.m. to 8 p.m. in the Ernie Morgan Center (3500A Granby Street, Norfolk) to begin this process. Public education and public dialogue are essential to its success. You are invited to attend and to add your voice to the dialogue. Engineers from Tetra Tech will lead the evening. They will give an overview of available “green technologies”, discuss specific applications in Knitting Mill Creek, and seek dialogue with participants to create understanding of how local citizens feel about the various alternatives. The comments generated during the evening will become part of the final report from Tetra Tech. That report will be completed by December, 2014. If you have questions or need directions to the Ernie Morgan Center, please contact John Stewart: jdstewart1@cox.net. 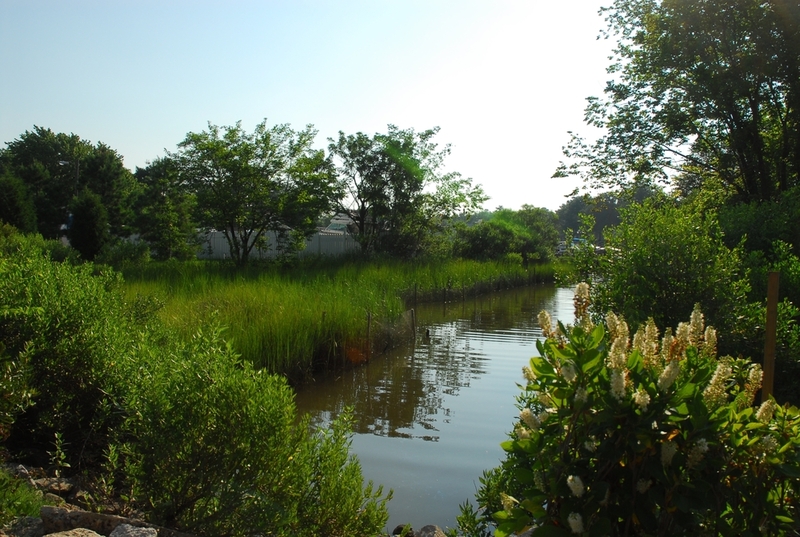 The first residential floating wetland launched June 8, 2014 in Norfolk, Va.